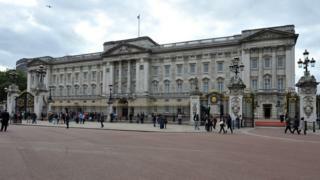 A woman has been arrested for trying to climb the front gates of Buckingham Palace, the Metropolitan Police said. She was detained by police officers at 17:40 BST and did not gain access to the palace grounds. The woman, believed to be in her 30s, was arrested on suspicion of trespass and is currently in custody at a central London police station. The incident is not being treated as terrorism-related, a police statement added.